Why Are Coyotes Sighted Regularly in The Neighborhoods? Many similar postings on social media, and many more by word of mouth, reach me regularly, be these from Filbert Street, Cow Hollow, Park Merced, Diamond Heights, Mission Street, etc. Sightings of coyotes in neighborhoods have been noted since I started documenting San Francisco coyotes over ten years ago, though more people now know about them due to the social media. Coyotes have been seen trotting down my own street in the late mornings, infrequently but repeatedly for some time — nowhere near a park. Some of my neighbors are thrilled and accept this in stride; others worry for themselves and their small pets, or they say it’s “wrong”. The sightings are usually in the very early morning or in the evenings, but not always — coyotes are not nocturnal animals, though they do tend mostly to avoid human activity times and areas. Backdrop: Coyotes are native only to America where their range has expanded considerably over the last 100 years or so from the southwestern part of North America to all over North America. More recently, over the last 20 years or so, they have been moving into most urban areas. It’s a relatively new development which is being studied all over the US and Canada: Chicago has 2000 of them, Los Angeles reports 5000 of them. They are in Central Park in New York City, in Atlanta, in Westchester, NY. There are multiple dozens here in San Francisco — but not hundreds and hundreds of them — we are a small peninsula, and territoriality limits their numbers in any particular area. Various reasons and explanations have been given for coyote sightings in neighborhoods or outside the parks. For instance, we have been told that adverse weather conditions — say, our recent 4-year drought — was a factor in neighborhood sightings — that coyotes were expanding their hunting range into neighborhoods and increasing their time there to compensate for the diminished food supply in the parks — therefore, the sightings there. Weather may be a contributing factor, but it is not the sole nor the primary factor for their being in the neighborhoods, otherwise I simply wouldn’t have been seeing them outside of the parks so regularly, in some cases daily, over the last ten years, well before the recent drought and when their population was sparser, and even now after the heavy rains this winter. An explanation for increased coyote sightings within the parks at certain times is when pups begin venturing further from their dens, or when parents can be seen patrolling and protecting den areas — a coyote may suddenly appear from nowhere. Throughout the year dispersing individuals (juveniles who leave home) may turn up in unexpected places until they eventually find their own niches, which may lead them miles outside of the city. All of these explanations — all valid — are offered as anomalies to the norm (the norm being that they aren’t in the neighborhoods). They all add a little more to our understanding of coyote movements in an urban area, but they miss the entire picture which I have been seeing. The bigger picture. Each coyote requires about a square mile to sustain itself, though it has been found that smaller areas sometimes can support them (see Stan Gehrt): need for the resources on the land is what drives their territorial behavior. To this end families claim areas and drive out non-family coyotes in order to preserve the resources there for themselves and their youngsters. This is how territoriality works in the parks and open spaces. It helps keep the population down in those places. But these same coyotes who often claim some of the largest and lushest parks (with streams or bodies of water, grasslands and plenty of thickets abounding in close proximity to each other: these are coyote’s required resources), have been seen trekking through neighborhoods routinely. Why don’t they stick to the parks and hide out just there? Why are we seeing them in the neighborhoods? It appears to be because of that same territorial imperative — an instinct built into their behavior through years of evolution — causing them to reach out to know the wider area, to confirm or redefine their boundaries, to know what is going on there and check it out, to push the envelope or be pushed back, to move into unclaimed or vacated areas, to search for a mate. It is because of this behavior that they came to most of our cities, and then city parks, in the first place. And it is because of this behavior that they are seen outside of the parks, not only close to the park peripheries but in the neighborhoods even further out. Truth be told, trekking through the ‘hoods and outside of park boundaries is part-and-parcel of urban coyote behavior: It’s what coyotes do. It’s a function of their daily territorial behavior. If and when they linger in any particular area, it is because of some attractant. These are my observations, supported by the reported observations of others in the city throughout many years. In addition, coyotes who claim smaller parks as their territories may occupy several natural open spaces — their territories are fragmented and they must move between them, crossing through neighborhood areas to do so. So neighborhoods are not excluded from their ranging areas. Several years ago I was able to follow along on a number of early evening coyote treks which I wrote up. I went along to find out where they went and what they did — it was a real honor that they allowed this. Here is an example of one of their shorter treks: Mapping Trekking Behavior. Other posts about coyotes in neighborhoods include Coyotes in Neighborhoods, and In The ‘Hood. What to do. So, seeing coyotes in neighborhoods is something that does occur regularly, whether or not the weather has impacted their food supply, or whether or not they are dispersing. What can be done? Is there an issue to be resolved? Not really, except to please just be aware of it so that you won’t be startled by one. They usually won’t hang around for long. Also, please don’t allow pets to be out-of-doors without supervision: even though coyotes avoid humans (unless they have been taught to approach by food-conditioning) coyotes don’t have the same aversion towards pets. If you are walking your dog and see a coyote, please tighten your leash and continue walking away from that coyote, dragging your pet if you have to. If coyotes begin hanging around your home and you don’t want them there, please remove all attractants, including bird-seed and compost which attract small rodents which, in turn, attract the coyotes. You can also scare them off by banging pots and pans as you walk towards them. If you need help with diverting a regular trekking pattern away from your yard, please send me a comment which I will reply to privately: I can put you in touch with the right hands. For an introductory summary of what to know and what to do about coyotes in the city, please see Coyotes As Neighbors or see the list of resources listed on this website on the first page, at the top. 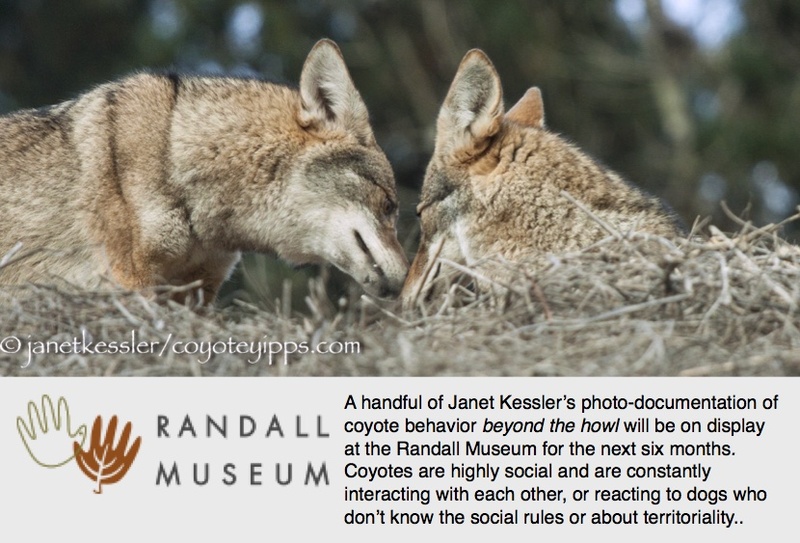 Here is a bit of fascinating information which I’d like to help make more accessible to the public, regarding what we know about coyote population dynamics, territoriality and the attempt by humans to “control and manage” their populations, i.e. kill them. For many years, we’ve been using this information — first documented by F.F. Knowlton in 1972 — to inform folks about the repercussions of eliminating coyotes: that killing them has the unintended consequence of actually increasing their populations. This letter from Robert Crabtree, based on his observations and studies, sums up this information precisely, concisely and interestingly. Please click on the the thumbnail to the left to read it and learn more about the fascinating life of coyotes from it!